Ordering (TRADE ENQUIRIES) can be done either phone (0044) 1204 61121, email or form - simply fill in the order form and send it back to us - click the 'ORDER TRADE ' button below to open the form . We ship across the world either by surface or by air - either by Royal Mail or by courier. Delivery time is usually five days to the USA and 2-3 days to the UK and Europe depending on the order. Buyers will be notified of shipping details prior to despatch. Beautiful Baker’s Twine is made in England by the sole UK manufacturer of cotton baker’s twine, James Lever 1856 Ltd. James Lever is a family run business now, in its sixth generation and have been manufacturing strings and twines in Bolton, Lancashire since 1856. Our Beautiful Baker's Twine is manufactured from 100% natural soft cotton. Our bakers twines are produced in a wide range of nostalgic colourful colourways and are available in a range of spool sizes, cards, cut lengths and hanks. Everlasto Beautiful Baker's Twine is the widest range of baker's twines and craft twines avaliable in the world. 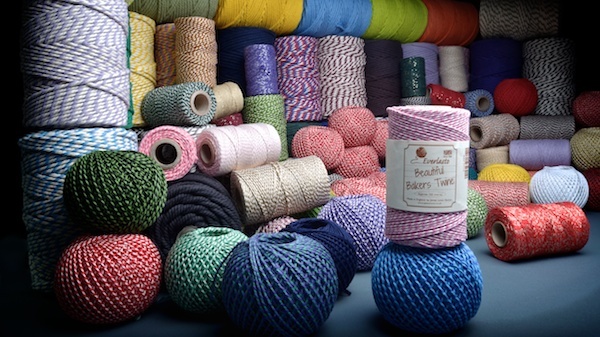 The extensive of range of baker's twines includes; Solid Coloured - Original - Two Tone - Tri Colour - Metallic - Sparkle - Chunky Baker's Twines - Braids - Jute Craft Twines & Soft Cotton Ropes. We are continually developing our range and looking to add new variations.